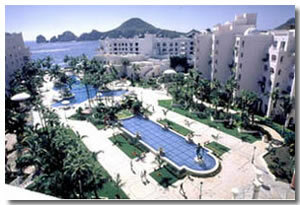 The Pueblo Bonito Rose resort in Cabo San Lucas is situated right on Medano Beach. A busier beach than the other beaches in Cabo San Lucas due to the fact it's safe to swim there. Los Cabos has a lot of strong under currents surrounding it making a lot of the beaches unsafe to swim at. All the rooms above the ground floor at the Pueblo have a balcony, and the rooms on the ground floor have patios. You can relax on these in the sun on the provided cushioned seating. The views from the rooms are either of the gardens surrounding the hotel of you can get a room with a partial view of the Sea Of Cortez. There are no baths here at the Pueblo all the rooms have showers. Some of the food can be a bit pricey at the Pueblo Bonito Rose resort in Cabo San Lucas. You can save yourself some money using the kitchen for your meals. Sleeping on the beds is comfortable enough. You can have additional feather beds to go on the top if you need them. The Pueblo has a large pool that is heated all year round. If you plan on reserving a chair by the pool do it very early. It's not uncommon for most of them to have towels on by 6.00 am. The pool leads straight onto the beach as well if you fancy a dip in the Sea Of Cortez. Mare Nostrum - This is a beautiful open air restaurant which has views of the Sea Of Cortez. Breakfast, lunch and dinner is À la carte. You also have themed buffets to enjoy like Italian, sea food and Tex-mex. L'Orangerie - This is an air-conditioned restaurant that serves a lot of seafood as-well-as fillet beef, and roast duck. There's also two smaller places to eat at the Pueblo. You have the pool bar that serves mainly fast food. And you also have the Super Deli where you can buy your groceries, and buy sandwiches and drinks that can be eaten in or outside. At the Pueblo Bonito Rose resort in Cabo San Lucas you're only walking distance from downtown Cabo. Once there you can enjoy the party atmosphere of clubs such as Cabo Wabo and the Giggling Marlin. Or sample some of the local Baja Californian cuisine at Panchos Restaurant or Edith's Restaurant. A car rental during your stay at Pueblo Bonito Rose is only necessary if you plan on driving out of Cabo San Lucas. If you decide to drive along the Los Cabos Corridor a lot or go and play on the golf courses. Being near all the nightlife, restaurants and shops many people don't see the need in a Cabo car rental. The Pueblo Bonito Rose is in a perfect spot for anyone who enjoys their party nightlife and popular-beach atmosphere.